If seeing is believing...then what does one do if you don't see what you expect to? This week I have certainly lost belief in my skills as a research scientist...and all because I can't get the roots of my plants to turn blue! My PhD is investigating what defence pathways may be important in determining how resistant a plant is to the parasitic weed, Striga gesnerioides. I'm particularly interested to see if two of the most well known plant defence hormones, Salicylic Acid (SA) and Jasmonic Acid (JA) have a role. To do this, I have been growing a series of transgenic Arabidopsis hosts, that express reporter genes for either SA or JA. The reporter genes code for the enzyme β-glucuronidase (GUS), which converts the substrate 5-bromo-4-chloro-3-indolyl glucuronide (X-Gluc) into a coloured blue product. However the promoter region of the transgene (which controls when the gene is turned on) has been engineered so that is is only activated if either JA or SA is present: for my experiments, the LOX-GUS reporter is activated by JA is present, and the PR1-GUS reporter by SA. What I'm looking for - bright blue roots! So I have been very busy growing whole batches of these reporter Arabidopsis lines, infecting them with Striga, harvesting the roots at different time points and adding X-Gluc. 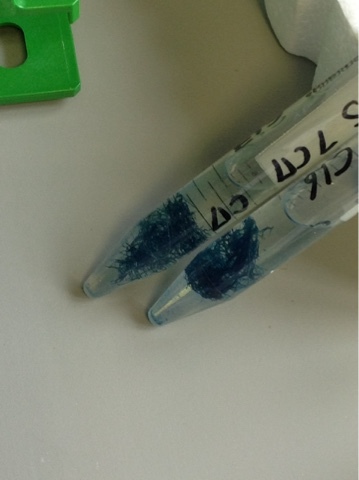 If the SA / JA pathway is activated by the parasite, then the GUS enzyme should act on X-Gluc, turning the roots bright blue. 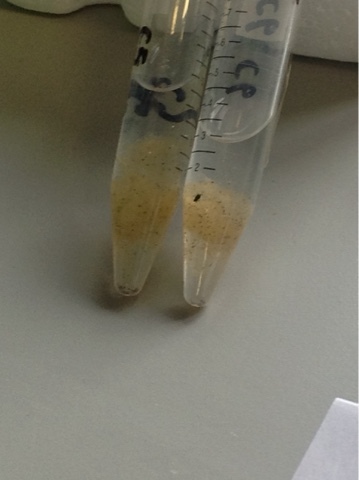 But each time I take my samples out of the incubator...nothing. Resolutely white roots. Could there be something wrong with my staining protocol? It's unlikely because each time I include a few transgenic plants that express GUS all the time, whether or not SA/JA is present. These have perfectly blue roots every time! So the away itself isn't the problem. In that case, could there be something wrong with the reporter genes themselves? To test this, I took some of the spare plants and applied SA or JA in solution to the roots. But even these didn't turn blue! I'm completely stumped...and so are my supervisors. Just possibly, the transgene isn't expressed in the roots at all....all the published studies I can find using LOX-GUS or PR1-GUS used leaf or shoot tissues. Whilst this negative results are hindering my current progress, it does raise interesting questions. Does the root system have a different set of SA or JA responsive promoters to the shoots and leaves? Or are other plant hormones, such as auxin or cytokinins, more important for defence in the roots? What I'm getting- resolutely white roots!